Aboriginal Australian kinship are the systems of law governing social interaction, particularly marriage, in traditional Australian Aboriginal cultures. It is an integral part of the culture of every Aboriginal group across Australia. 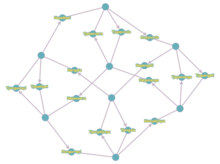 Subsection systems are a unique social structure that divide all of Australian Aboriginal society into a number of groups, each of which combines particular sets of kin. In Central Australian Aboriginal English vernacular, subsections are widely known as "skins". Each subsection is given a name that can be used to refer to individual members of that group. Skin is passed down by a person's parents to their children. The name of the groups can vary. There are systems with two such groupings (these are known as 'moieties' in kinship studies), systems with four (sections), six and eight (subsection systems). Some language groups extend this by having distinct male and female forms, giving a total of sixteen skin names, for example the Pintupi (listed below) and Warlpiri. While membership in skin groups is ideally based on blood relations, Australian Aboriginal subsection systems are classificatory, meaning that even people who are not actual blood relations are assigned to a subsection. They are also universal, meaning that every member of the society is assigned a position in the system. Subsection systems are found in Aboriginal societies across much of Central, Western and Northern Australia. On the basis of detailed analysis and comparison of the various subsection systems and their terminologies, and in particular the apparent prefix /j-/ for male and /n-/ for female, it has been identified as a social innovation originally from the Daly River region of the Northern Territory, which then spread rapidly southwards to other groups. Munyuku, Madarrpa, Warramiri, Dhalwangu, Liyalanmirri. Marrangu, Djapu, Datiwuy, Ngaymil, Djarrwark. Fish, stone, river, sea etc., belongs to one or the other moiety. Things that are not either Dhuwa or Yirritja are called wakinŋu. Yolŋu also have a kinship system with eight subsections (four Dhuwa and four Yirritja which is what creates moiety). The Gamilaraay language group from New South Wales have a four section system. Graph that sums up kinship in the Martuthunira society. 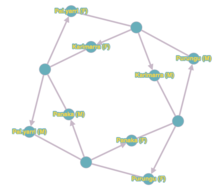 Unnamed nodes stand for different marriage types : they are linked to spouses by simple lines and to children by arrows. The Martuthunira language group from the Pilbara region of Western Australia have a four section system. (The spelling l.y indicates that the letters represent two distinct phonemes, and are not a digraph). Similar systems are found across most language groups in the Pilbara, though with some variation in the forms of the names. For example, speakers of Ngarla use Milangka where Martuthunira use Pal.yarri. The Alyawarre language group from Central Australia also have a four section system, but use different terms from the Martuthunira. Each Lardil person belongs to one of these groups. Their paternal grandfather's subsection determines their own; so a Balyarriny man or woman will have a Balyarriny grandfather. Members of each group may only marry members of one other, specified, group. Once a person's subsection group is known, their relationship to any other Lardil can be determined. A Ngarrijbalangi is a 'father' to a Bangariny, a 'father-in-law' to a Yakimarr and a 'son' to another Bangariny, either in a social sense or purely through linearship. The mechanics of the Lardil skin system means that generations of males cycle back and forth between two subsections. Ngarrijbalangi is father to Bangariny and Bangariny is father to Ngarrijbalangi and similarly for the three other pairs of subsections. Generations of women, however, cycle through four subsections before arriving back at the starting point. This means that a woman has the same subsection name as her (matrilineal) great-great-grandmother. Graph that sums up kinship among Warlpiri (Australian aboriginals). Unlabelled nodes stand for allowed weddings. Resulting children subsections are indicated by arrows. Each person therefore has a patrimoiety and a matrimoiety, a father's and a mother's subsection group. Outsiders who have significant interaction with such groups may be given a 'skin name', commonly based on the people they have interacted with and the types of interaction. The variety of English used by many Australian Aboriginal people employs kinship terms in ways that are based on their equivalents in Australian Aboriginal languages. Aunty and uncle are terms of address for older people, to whom the speaker may not be related. Brother and sister—as well as siblings this term is used to refer to children of one's mother's sister and of father's brother (cousin), just as in many indigenous languages. Cousin-brother and cousin-sister are often used to refer to children of one's mother's sister and father's brother. Cousin refers to children of one's father's sister and mother's brother, but may be extended to any relative of one's own generation, such as one who might share the same great grandparent as their own great grandparent, which is a second-cousin in Aboriginal terms. In south-east Queensland, daughter is used to refer to any woman of one's great-grandparents' generation. This is due to the cyclical nature of traditional kinship systems and mirrors usage in many Australian languages. Father and mother include any relative of one's parents' generation, such as uncles, aunts, their own cousins and in-laws. Grandfather and grandmother can refer to anyone of one's grandparents' generation. Grandfather can also refer to any respected elderly man, to whom the speaker may not be related. Poison refers to a relation one is obligated to avoid. See avoidance speech. The term second, or little bit in northern Australia, is used with a distant relative who is described using a close kinship term. For example, one's second father or little bit father is a man of one's father's generation not closely related to the speaker. Usually having a second mother is having a woman of your own mother's generation who seems to act like a mother and would most likely care for you if anything were to happen to your own parents. It is contrasted with close, near or true. A skin or skin group is a section determined by the skin of a person's parents, and determines who a person is eligible to marry. Son can refer to any male of the next generation, such as nephews, just as daughter can refer to any female of the next generation, including nieces. ^ McConvell, Patrick (October 1996). "Backtracking to Babel: the chronology of Pama-Nyungan expansion in Australia". Archaeology in Oceania. 31 (3): 125–144. doi:10.1002/j.1834-4453.1996.tb00356.x. ^ Sharp, Janet; Nicholas Thieberger (1992). Bilybara: Aboriginal languages of the Pilbara region. Port Hedland, Western Australia: Wangka Maya, The Pilbara Aboriginal Language Centre. ISBN 0-646-10711-9. ^ Wafer, Jim (1982). A Simple Introduction to Central Australian Kinship Systems. Institute for Aboriginal Development, Alice Springs, Northern Territory. Binnion, Joan (1979) The Lardil People of Mornington Island (Student Handbook), Aboriginal Community College, Port Adelaide. Dousset, Laurent, 2011, Australian Aboriginal Kinship: An introductory handbook with particular emphasis on the Western Desert, Marseille, Pacific-credo Publications. Hansen, Kenneth C. and Lesley E. Hansen, 1979, Pintupi/Luritja kinship, Alice Springs, NT, Institute for Aboriginal Development.